Along with Balarama Krishna went to sage Sandipani's aashram and mastered all knowledge in just 64 days. Thou brought back Thy guru Sandipani's dead son from Yama's abode and gave him by way of Guru-dakshinaa , in the process, acquiring the conch, Panchajanya, from the demon who had kidnapped the Guru's son and swallowed him after killing him, and then,then went back to Thy city sounding the conch Paanchajanya. Repeatedly thinking overwhelming love of the beautiful Gopikas Krishna sent his close friend Uddahava to them with a message. There he stayed at Nanda's home. 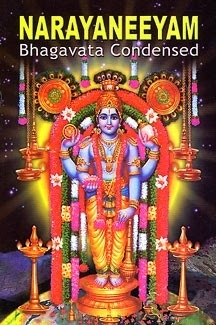 At night, Uddhava enquired about Nanda and Yashoda's wellbeing and about Vraj in general. Next day, when the Gopis got the news of Uddhava's arrival, they thronged in and around Nanda's residence. They recognized the chariot parked in front of the gate. It was the same chariot on which Krishna and Balarama had departed for Mathura. First they thought that their beloved Krishna had returned. But The Gopikas saw Uddhava donning charming clothes and ornaments similar to Krishna. They remembered Krishna again and again and his various deeds and sport in great detail and with their throats almost choked with emotion at the thought, they forgot their natural shyness and somehow managed to speak to Uddhava with faltering words. Gopis said to him: "O gentleman, Is it that you are sent by the heartless Krishna to comfort his parents ? Where is he? The beloved of the city beauties? O Lord O Hari! Protect us. Alas which one of us women can forget the embrace of the nectarine form, the kisses of intense love and the frolicsome words of the beloved one? The Gopikas bemoaned their fate with such words of despair and were overwhelmed with grief. Uddhava comforted them with Krishna’smessage of deep spiritual import. They came to their normal selves and thereafter experienced his inner presence. Uddhava spent some days with the totally devoted Gopikas joyfully and happily narrating various incidents about Krishna. The Gopikas always sang songs about Krishna. Everywhere while doing their household chores, they narrated Krishna ‘stales, amongst themselves. They even spoke about Krishna in their dreams.Their actions were mostly imitations of Krishna ‘s actions as they tried to personify Krishna .Everything that there, was permeated by Krishna’s presence. Observing all this that great devotee Uddhava was wonderstruck and left stunned. Uddhava appreciated the extraordinary fortune of the gopis, who were relieved of all material pangs and anxieties by placing on their beautiful high breasts the lotus feet of Krishna which are worshiped not only by the goddess of fortune but by such exalted demigods as Brahma and Lord Siva, and which great yogis meditate upon within their hearts. Thus Uddhava prayed to be constantly honored by the dust from the lotus feet of the gopis, whose chanting of Lord Krishna's transcendental pastimes has become celebrated all over the three worlds. Uddhava consoled and comforted those Gopikas and mitigated their grief with krishna’swords, such as : "I shall come back to you soon; only pressure of work has so fardelayed my coming, grieve not even while I am away, since memory of past association is strong and firm; very soon, with the attainment of Brahmananda, meeting or separation will become one and the same to you. Along with Balarama Thou went to sage Sandipani's aashram and mastered all knowledge in just 64 days. in order to set an example to all, that learning under a preceptor is essential for everyone. By way of Guru Dakshina, Thou didst recover the Guru'sdead son from the abode of Yama and restore him to his parents, and gave him by way of in the process, acquiring the conch, Panchajanya, from the demon who had kidnapped the Guru's son and swallowed him after killing him, and then, return to Thy city, Mathura, sounding the Panchajanya. Repeatedly thinking overwhelming love of the beautiful Gopikas Krishna sent his close friend Uddahava to them with a message. Also with the desire to demonstrate to him the intense devotion of those great devotees which was rare in the whole world. Gokula's prosperity was an indication of the magnitude of Thy greatness. Reaching there in the evening, Uddhava delighted Nanda and Yashodaa with Thy many news. In the morning the lotus eyed women of Gokula saw the bejewelled chariot and suspected Thy arrival. They came to know that one of Thy emissaries had come. Abandoning their work, they gathered at the house of Nandagopa. The Gopikas saw Uddhava donning charming clothes and ornaments similar to Thine. They remembered Thee again and again and Thy various deeds and sports very thoroughly. They were full of emotions and were choking for words, and somehow managed to speak to Uddhava with faltering words. They had forgotten to obseve the norms of behaviour and courtesies, and the differences between themselves and other. Is it that you are sent by the heartless Krishna to comfort his parents ? Where is he? The beloved of the city beauties? O Lord O Hari! Protect us. Alas which one of us women can forget the embrace of the nectarine form, the kisses of intense love and the frolicsome words of the beloved one? The Gopis who were your sweethearts further cried, due to their excess love O Ocean of Compassion! Reveal to us once that form, so that we may once more embrace that form of Thee!“Please give us your well pressed flower like body ,With disheveled hair due to Rasa Kreeda you played with us,Which is drenched with sweat here and there making it more desirable,For hugging and embracing once more , Oh ocean of mercy “Oh God who attracts all the three worlds by your love. The Gopikas bemoaned their fate with such words of despair and were overwhelmed with grief. Uddhava comforted them with Thy message of deep spiritual import. They came to their normal selves and thereafter experienced Thy inner presence. Uddhava spent some days with the totally devoted Gopikas joyfully and happily narrating various incidents about Thee. The Gopikas always sang songs about Thee. Everywhere while doing their household chores, they narrated Thine tales, amongst themselves. They even spoke about Thee in their dreams.Their actions were mostly imitations of Thy actions as they tried to personify Thee. Everything that there, was permeated by Thy presence. Observing all this that great devotee Uddhava was wonderstruck and left stunned. Uddhava lifted the spirits of Thy beloved,This is my Radha's favourite. My dear one speaks like this. My dear friend! Why are you silent like my dear proud one (Radha)?' 'In this way O dear friend (Radha) your beloved (Krishna) speaks to me when we are alone.' With these words Uddhava gladdened Thy dear lotus eyed Radha. Uddhava consoled and comforted those Gopikas Passing to them your message “ I would come to visit you soon,I am not coming only due to pressure of work,Do not grieve because even in parting memory becomes very strong,When soon you would get divine joy the attainment of Brahmananda,meeting or separation will become one and the same to you." O Lord of Guruvayur ! Thy heart was filled with delight on seeing Uddhava back fromGokula, overwhelmed by the devotion of the Gopikas to Thee, exclaiming : "Such devotion is, indeed, rare and unparalleled in all three worlds, and has neither been seen nor heard anywhere. My salutations to the Gopikas. " May Thou save me from all my afflictions.